A watermark from the notable papermaker J Whatman is visible in transmitted light. The map is drawn on hand-made laid rag paper. Archival materials see some of the hardest use and wear of all paper objects, because their original purpose was usually utilitarian. Sometimes ephemeral, often consulted, maps are no exception. The maps that come in to Book and Paper Conservation Services for treatment show damages typical of handling and haphazard storage, such as tears, breaks, creases, soiling, and evidence of previous restoration as owners have performed DIY repairs in order to return functionality to an item in frequent use. 1848 Map of Sarnia, Ontario, Canada. Before conservation treatment, the map suffers surface dirt, tears and losses, as well as previous repairs with damaging adhesive tape on the verso. An 1848 map of the town of Sarnia, Ontario that we conserved last year is a perfect example. The map, now part of the collections of the Lambton County Archives, shows several streets close to the shore of the St. Clair River, with specific lots carefully laid out and numbered and buildings and geological features marked. The map is an original, and has been hand drawn with pen and ink, with roads and waterways highlighted in watercolour. It’s a utilitarian, yet beautiful object, with elegant penmanship and a green silk ribbon folded and sewn around the perimeter of the paper. It may be a thoughtfully designed piece, but it was meant foremost to convey information, and the handling and use it has seen are evident in the damages it now presents. Lambton County Archives brought the map in for conservation treatment in order to preserve a delicate piece of Sarnia’s history, and make it safe for researchers to access and study. Map in raking light, showing severe planar deformation. The map suffered a variety of condition and damage issues caused by use and age, dating from it’s lifetime before entering the Archives. A heavy layer of surface dirt, tears and losses, and adhesive tape residue on the verso were present and needed to be addressed. After thorough condition reporting and photo-documentation, an essential step in all our conservation projects, the treatment began. Surface cleaning using a smoke sponge is a slow and tedious process, but one which in this case yielded dramatic results. The time lapse images of the cleaning show the grime coming off section by section, brightening the paper beneath. Surface cleaning the verso of the map. Time lapse video showing the process of surface cleaning the map. Next, the remains of the repair tape applied by a well-intentioned soul was addressed. The tape carrier had long since flaked off, but the adhesive residue remained, brittle and yellowed and crosslinking with the paper fibres on a microscopic level. Some solvent tests revealed a match, and by careful swab application, over suction to draw out the dissolved residue, we were successful in removing the disfiguring material. Luckily there was not much staining left in the paper after this was removed, and more stable repairs could now be applied. Solvent removal of adhesive tape residue. In keeping with conservation aims and ethics, a new, stable and reversible repair method was chosen, that of Japanese tissue adhered with wheat starch paste. Wheat starch paste is a clear, strong and flexible adhesive that will not fail, discolour or become brittle with time. It is used by paper conservators to attach thin strips of handmade Japanese tissue to paper objects, to repair tears and breaks. The long-fibred, acid-free tissue holds together the breaks and can be selected to match the colour and thickness of the artifact, being nearly invisible after application so that it won’t disturb the aesthetics of a piece. These repairs were performed on the verso of the map, and fills were added to the losses with a similar process, completing the repair of the mechanical damages on the map. Japanese tissue repairs applied to the verso of the map, with LED light pad underneath. After conservation treatment, the map is clean and stable. After treatment the map is bright and clean, the damages are repaired and damaging materials have been removed so as not to cause further long-term deterioration. Conservation treatment has restored stability and aesthetic integrity to the map. It was returned to Lambton County Archives as good as new, and is now kept in their newly renovated storage facility, ready to serve researchers interested in Sarnia’s early history. Please visit the Archives in person or online to learn more about their collections and the preservation strategies they undertake for artifacts in their care. To learn more about archival conservation at Book and Paper Conservation Services, check out our portfolio section or read about our process. Bird's Eye View of London, Ontario, Canada, 1872, before conservation treatment. Book and Paper Conservation Services recently had the privilege of restoring this wonderful early Bird's Eye View map of London, Ontario, Canada. The detailed colour lithograph print, dated 1872, resides in the collection of Western University Archives, which holds extensive records of London's history. The map is an illustrated vision of the city from a bird's eye perspective, a common theme in the late 19th century. It was drawn by the artist E. S. Glover, and produced by Strobridge Lithographing Company, in Cincinnati, OH. It would have been distributed in London and purchased by prominent local citizens at the time for display in homes and businesses. Detail of the 1872 map showing streets of London, Ontario, and the Military Garrison in what is now Victoria Park. The map illustrates significant buildings in the city as of 1872, such as the Covent Garden Market, Labatt Brewery, and the military garrison, situated on land which is now Victoria Park. The locations are numbered in a key in the bottom margin. The map is extremely interesting as a historic document because it depicts a number of streets and locations which no longer exist or have since been renamed. When it arrived at our studio, the map suffered from a variety of condition issues. After examination and consultation with University Archivist Robin Keirstead at Western's Archives and Research Collections Centre, an extensive treatment protocol was determined. During the course of conservation treatment, the print underwent almost every process in a paper conservator's repertoire; it was an extremely satisfying project for our studio. The map was produced by a lithographic printing process on machine-made wood pulp paper, a typical paper but prone to discolouration over time. Sometime in its life, it had been mounted to a black pulp board backer, a very acidic material which had further contributed to the overall yellowing and brittleness of the paper. It also exhibited pronounced discolouration in vertical bands across the image, as well as extensive tears and breaks in the paper and minor losses around the perimeter. Tears and losses along the border of the print. Creases and breaks distorting the surface. In short, it was in urgent need of conservation treatment to keep it from deteriorating further, and to restore its original detail and vibrancy. Conservation included surface cleaning to remove dirt and grime. The conservation treatment to address these damages included several stages. First, the print was surface cleaned to remove loose dirt and grime, and then the acidic backing was painstakingly removed with a scalpel and metal spatula, working from the verso to avoid any accidental damage to the print. Next, the print was washed and light bleached to brighten the paper tone. The yellow discolouration products were removed from the paper in this process, returning the image closer to its original colouring and removing the distracting bands of stain from the print. It was also deacidified to halt further deterioration of the cellulose. The Bird's Eye View of London is washed and deacidified to remove discolouration. Once washed, the lithograph was lined onto a new, stable backing of Japanese paper, to provide support and repair the breaks and losses. This backing will not cause discolouration the way the old board did, and will help the print remain stable while also being slightly flexible. Wash water becomes progressively less yellow as the print is cleaned. Behind, the washed and lined lithograph is visible brighter. The Bird's Eye View of London, after washing and lining on a stable Japanese paper backing. The final step in the conservation treatment was to inpaint losses to the printed image where cracks and breaks had disturbed the surface. Using watercolours and a delicate brush, the image was restored. Inpainting to restore losses in the printed surface. The restoration of this beautiful historic artifact was extremely successful, and the satisfying results can be seen below. The paper tone has been brightened, allowing the image to be viewed without distraction; the damages have been repaired and print is supported and stabilized with a new backing. It has been returned to the Archives where it will be stored and preserved in ideal conditions, and can be accessed by future researchers and interested Londoners for years to come. Bird's Eye View of London, Ontario, Canada, 1872, before and after conservation treatment. Art conservation is an extremely satisfying occupation, and Book and Paper Conservation Services was very pleased to have contributed to the preservation of this important artifact. If you have historic or archival materials or antique prints that you are interested in having restored, don't hesitate to get in touch with our studio. There is no charge for a consultation, and we are always happy to discuss conservation options with you. 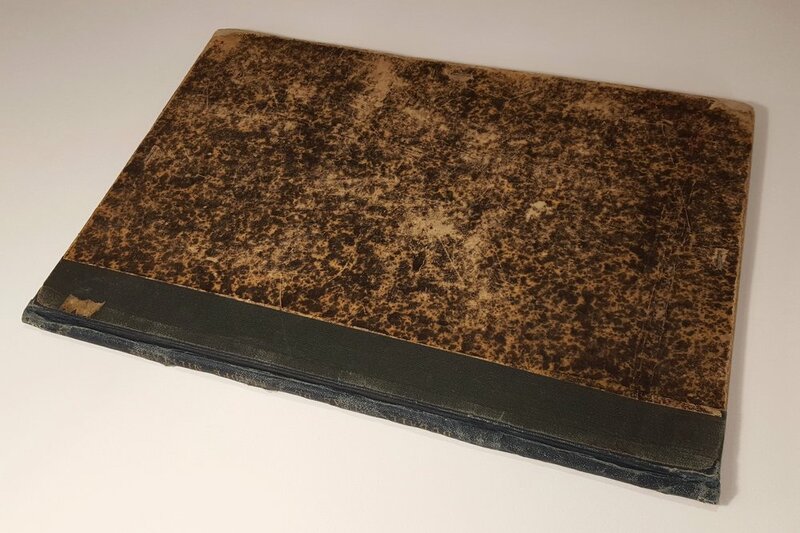 One of the challenges of rare book conservation is that books are composite items that can contain many materials, including paper, cloth, thread, board, leather, and various media. The combination of materials and the mechanical action necessary to use a book create problems and damages; a conservator skilled in the conservation of both paper and bound volumes is uniquely qualified to repair and restore rare books. This delicate item, Atlas de L'Europe Militaire, 1880, recently came through our studio needing repairs to both the binding and the fold-out maps inside. Maps in books are quite often found in disrepair; due to the nature of folding and unfolding tears are very common, as well extra creases and soiling along folds and edges. Rough handling of the oversize volume had also caused some damage to the cloth spine. Large fold-out map with tears and breaks. Repairs to the maps involved lining up and repairing the tears with Japanese tissue and wheat starch paste. Fills were also made to replace lost areas of paper. Preparing to repair tears with Japanese tissue. Fold-out map torn along creases. The map is repaired and properly folded. Next, repairs to the cloth spine were performed using Japanese paper toned to match the colour of the original binding material. Repairs were executed on the spine and both endcaps where the cloth had frayed and torn, stabilizing the back of the book. The spine of the book is repaired. These repairs have brought a ragged rare book back to a tidy and stable condition, allowing the binding and maps to be safely handled and enjoyed. If you have similar rare or antiquarian books you are interested in having restored, get in touch with us today.